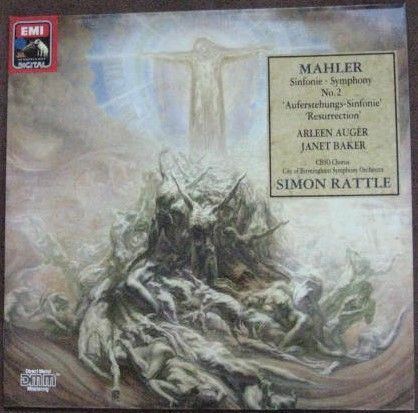 33rpm 2 LP Record Set of Mahler SYMPHONY NO 2 (Resurrection), featuring the CBSO Chorus with Arleen Auger and Dame Janet Baker (Chorus Master: Simon Halsey) and the City of Birmingham Symphony Orchestra conducted by Simon Rattle. 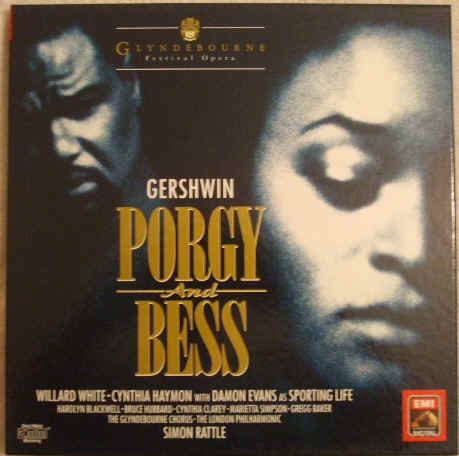 It was issued on the Stereo/Digital EMI large dog in stamp label in 1987. Catalogue number: 27 0598 3. German pressing. The record itself is graded better than excellent, with no visible scratches/marks when viewed under normal house lighting. Superb sound quality, with NO jumps, pops, clicks or crackle. Just about faultless playback. A stunning copy! Minimal to no spindle wear. Labels very clean, no discernible spider marks. The gatefold sleeve is also graded better than excellent, with only very light handling and storage wear. The spine is intact and strong with no loss to the lettering. The inner sleeves have no wear to speak of.